My 1993 Christmas Tiki Hut. | Dinosaur Dracula! Hot damn, I finally found it. Photographic evidence of that weird thing I did back in junior high. For several years, I used our family’s Christmas Eve party as an excuse to throw my own. Guests were encouraged away from the dinner table and into my bedroom, for a look at what I called THE CHRISTMAS TIKI HUT. My family indulged me, not because they wanted to eat cheese that had been sitting out for sixteen hours, but because it was obviously so important to me. For a few years, I cared more about my Tiki Hut than any other Christmas-related thing. The best part might have been the shopping. Every year, I’d beg someone to take me to Price Club, which was the precursor to Costco. 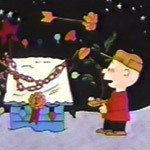 Using money that couldn’t have been mine, I’d load up on jumbo-sized packages of snacks that only a thirteen-year-old psychopath would dream of serving for Christmas. People nibbled, but most of the spread was still fully intact by the end of the night. Since much of that spread consisted of the same junk food I already lived on, I didn’t mind. During the week between Christmas and New Year’s, I was never anything but alarmingly bloated. When I zoom into the stuff on that table, I’m surprised that they were so agreeable. Many of these foods would’ve been questionable even if they weren’t being served in a kid’s filthy bedroom. On Christmas Eve. Giant bowl of Pepperidge Farm Goldfish! You know those huge cartons of Goldfish that are generally only found at warehouse stores? This was that, emptied into the world’s biggest salad bowl. 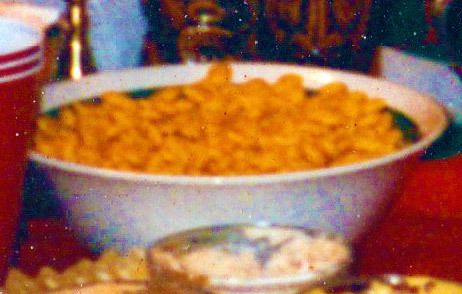 The menus of my Tiki Huts varied, but Goldfish crackers were always there. Most were gotten from Chinese restaurants. Sometimes they’d let me have them for free. Other times, they charged me six bucks or something. I still have most of them, including this “Fu Manchu” character. Note the coconut accessory. 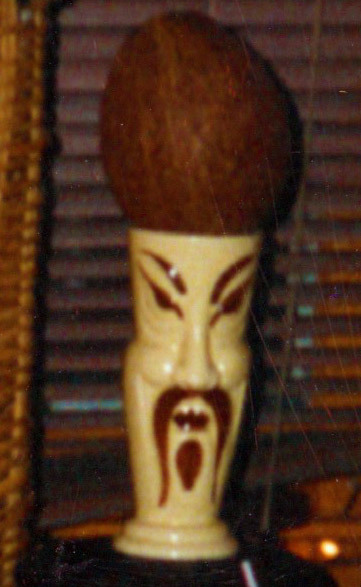 My understanding of Tiki culture was and remains perfectly cliché. You can tell that this was the work of a child. Triscuits and plain old Saltines, joining three tubs of God Knows What Cheese. For added appeal, I garnished the platter with loose piles of cranberries. Huh? 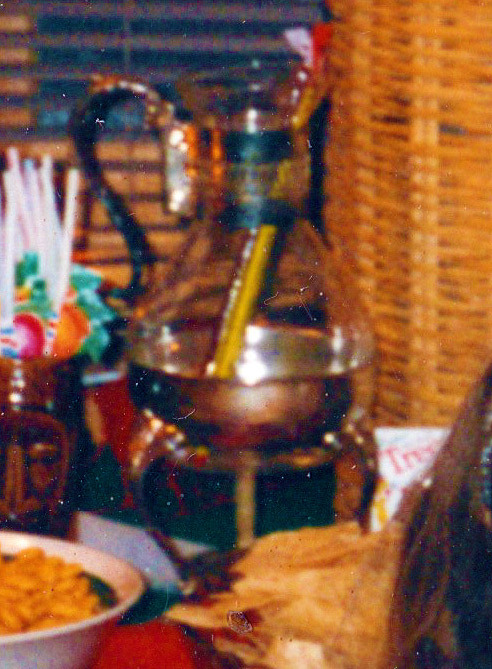 The coffee carafe full of Slim Jims! Well, duh. 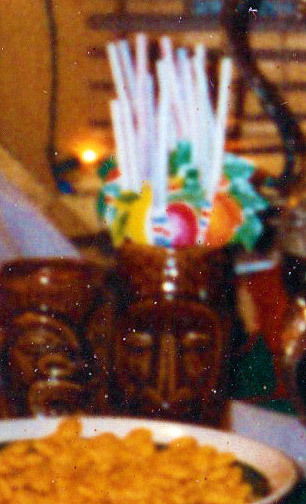 You can’t have a Christmas Tiki Hut without goofy straws. Each had a foldout something-or-another, from palm trees to exotic fruits. First are many chunks of cheese. Looks like I couldn’t settle on any one style. Some of it was cubed. Some of it was in neat slices. And some of it was apparently whittled into the loose shapes of kayaks. NOBODY ate those, nor did I expect them to. I just refused to let any Christmas season slip by without getting funky with dyed fish eggs. We all had our quirks. I wish I had a better photo of this. The Olive Christmas Tree was such a triumph. I’d inherited an oddball Christmas decoration – some green tree made out of foam. With the help of toothpicks, I covered the entire thing in pimento-stuffed olives. I WAS SO PROUD OF THIS. My family doesn’t read Dino Drac. Not right now, at least. Someday, I’ll end up on a special report, and they might want to pinpoint the exact moment where everything went wrong. It could lead them here. So guys, if you ever read this… I’m really sorry that I made you eat olives off of a foam Christmas tree. Your patience was the stuff of legends. And here it is! The crème de la crème! All of the other things in my Christmas Tiki Hut were just small waves, lapping up to this big giant rock. 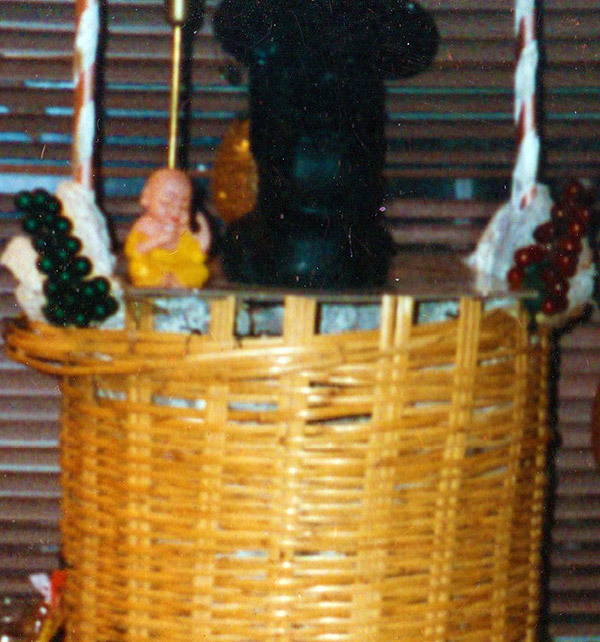 For many years, I’d spied a strange wicker wishing well in the corner of our attic. I didn’t know what it was, but I NEEDED to make it a part of my bedroom. 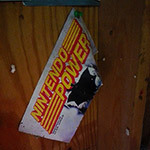 In 1993, my parents finally let me drag it out. 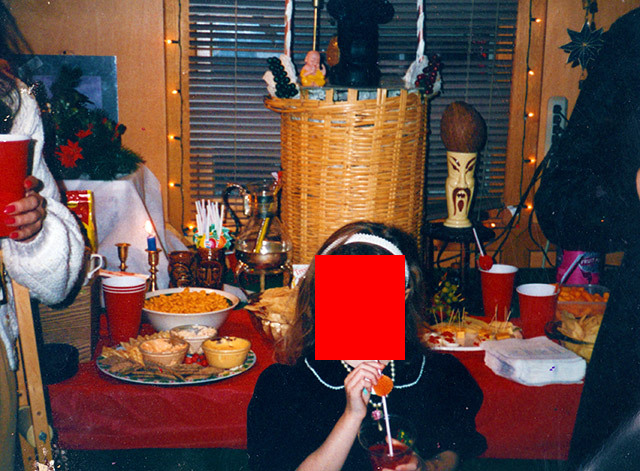 The well had been a mainstay at our family’s bridal showers. I don’t know if this is a still-done tradition, but brides-to-be would receive small, practical household items, all of which were thrown into the well. This thing had been in our family for generations, marking only the most special of occasions. And then I turned it into a goddamned Easter Island shrine. On top is a moai statue that my brother found in Disney World many years prior. He eventually let me have it, and it’s still one of my prized possessions. 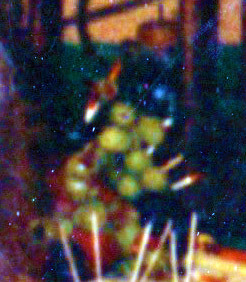 That statue was a key component in all of my Christmas Tiki Huts… and Birthday Tiki Huts… and much rarer Independence Day Tiki Huts. Even today, it’s one of the few things that I’m actually careful with. So there you go. One of my most important childhood traditions, finally revealed. I used to decorate my bedroom like Fake Hawaii, and make everyone eat Slim Jims. Saturday Television of a Misspent Youth. 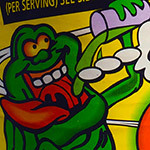 The Mostly-Complete History of Ecto Cooler. 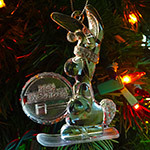 Energizer Bunny Ornaments from the ’90s! 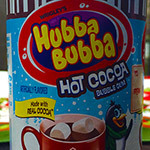 2015’s Best Holiday Junk Food, Part 3!